Sometimes it feels like I end up with a lot of pictures on my phone. 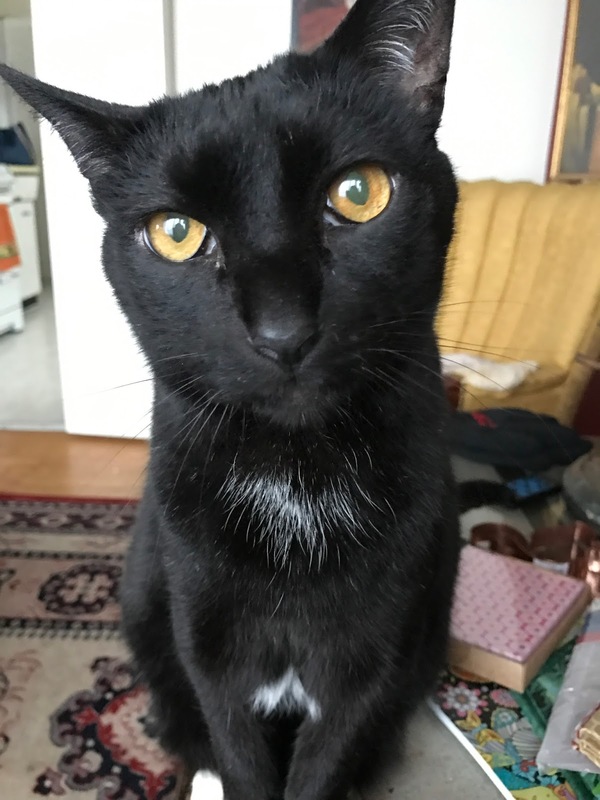 Since I always have it with me, it’s a lot easier than it once was to snap a quick picture of things that catch my attention as I go through the day (and maybe a few pictures of my cats looking adorable). It’s rare that these images make it any further than Facebook these days, but I do love the idea of making a quilt or other project that is inspired by a specific photo. 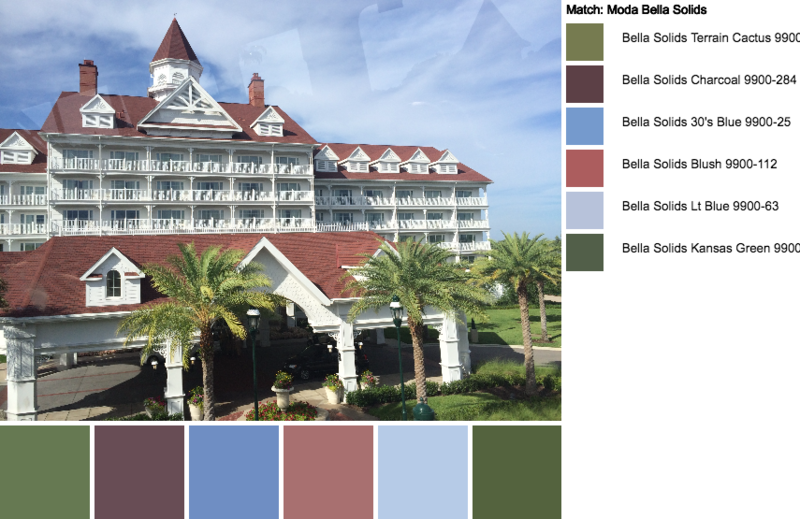 This idea gets one step closer to fruition by using online color palette tools to identify the colors in the photo. This individualized color palette is then easy to either print out or pull up on my phone when I’m ready to pull fabrics and threads for project. There are many different palette builder tools online, but the one I like the best is the Palette-Builder 2.1 by Play Crafts. It was super easy to upload my photo and download the suggested palette, which are my two primary criteria. 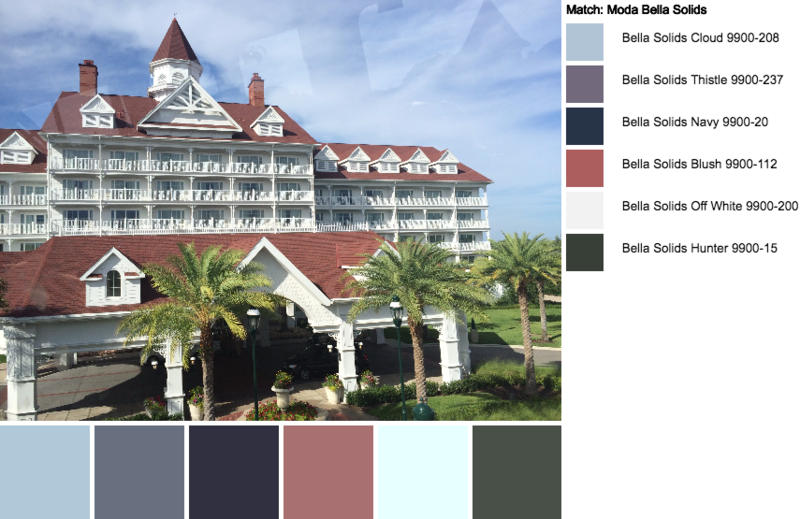 This palette builder gets bonus points for its list of suggested Moda Bella Solids that match the color palette. I took this shot of the Grand Floridian Resort at Disney World when we were there last summer for a vacation. It’s a little bit blurry since it was taken from the monorail, but I think it give it this quasi-artistic feel that is kind of nifty. We had a great experience here, and I could definitely see using these colors together in a project. In my first attempt I wished that the palette builder had captured some of the green hues in the palm trees and grass but it was spot on in pulling the various blue-teal-grey colors. You can choose to focus on different colors in the picture by moving the color-picker circles around on the photo, which was an easy solution. « UFO Buster Challenge Link Up and Giveaway!